Did you know that Hass avocados didn’t exist until the 1920’s? In 1926, Rudolph Hass, a postman and horticultural experimentalist in Riverside, California tried to grow some avocados from seeds and graft the seedlings. One stubborn little tree failed to graft, but still it grew, yet refused to bear fruit. Despite the failed graft, Hass decided not to cut it down, but instead he left the tree to grow on its own. Years later, his kids discovered dark fruits on the tree, covered with thick, bumpy, black skin looking unappealing in appearance. They noticed this new avocado was richer and nuttier than the avocados they were familiar with and it was slightly oily in taste. As the tree produced an abundance of fruit, Hass began to share with family and coworkers, eventually selling his surplus to a grocery store in Pasadena where they sold for $1 each (equivalent to $14 today!). He even took them to the state fair where they won blue ribbons. His avocados were creamier and had more flavor than the then popular Fuerte avocado. In 1935, Hass was the first person to patent a tree in the U.S., naming it after himself. It’s commonly misspelled Haas and mispronounced “hoss”, when in fact, it actually rhymes with pass and class. From there, he began to produce and sell seedlings with a local nurseryman, Harold Brokaw. Unfortunately, because patents on trees were new, they were not well respected, so a grower could buy a single seedling of theirs and use it to graft an entire orchard of avocado trees. Because of this, Hass only collected around $4,800 in royalties from his patent. However, the original tree he planted, “the Mother Tree”, is responsible for all Hass Avocados which make up 80% of avocados in the US, and the species still bears his name. Who knew that one failed experiment could create the world’s most beloved avocado! The mother tree stood in La Habra Heights, California until it developed root rot in the 1990’s and had to be cut down in 2002. Rudolph Hass’s nephew stored the wood in a nursery in Ventura where he has used it to make jewelry, keepsakes, and other souvenirs. Though the mother tree no longer stands, her descendants cover the globe, from the US and Mexico all the way to Kenya and South Africa! Why do we love Hass avocados? Many people choose Hass avocados for their nutty and creamy taste, but there are other reasons why they are America’s most popular type of avocado! Through his failed experiment, Rudolph Hass created an avocado with a sturdy root and a thick skin. These qualities allow the plants to withstand harsher weather during the growth process and the fruits don’t damage or bruise from handling during their journey to the grocery store (or our guacamole factory!). Their thick skin also allows them to have a longer shelf life, which is desirable not just for grocers, but consumers as well. 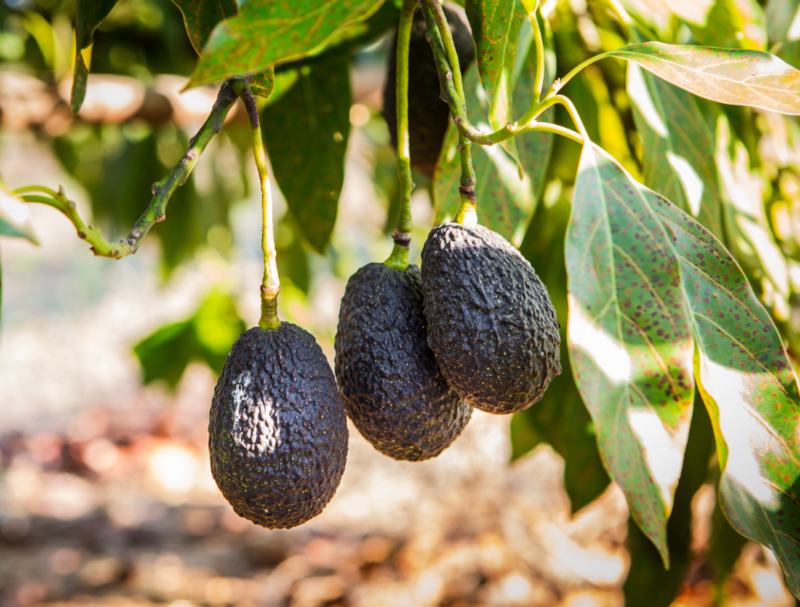 Unlike the previously most popular avocado (Fuerte), Hass avocados are slightly bigger and rounder with smaller seeds, thus yielding more meat to the consumer. Their taste is different than other avocados and pairs nicely with a variety of foods. With higher levels of healthy fats, their oil can be a healthy and safe alternative to cook with. Hass avocados also contain all kinds of vitamins and even have more potassium than bananas! Avocados are naturally low in sodium.